A small piece of Lepidodendron trunk, a giant club moss of the Carboniferous period. Members of the Plant Kingdom grow from an embryo into a multicellular organism with cellulose in their walls. They photosynthesise (employing the sun's energy to make sugars from water and carbon dioxide) using chlorophyll (the green coloration). A vascular plant is one that contains special cells that allow water to move through it. Non-vascular plants lack these special cells. Cooksonia, one of the earliest vascular plants that colonised the land during the Silurian. The first land plants were probably relatives of the mosses, liverworts and hornworts of today (non-vascular bryophytes). Fossils of these very fragile plants are rare. The oldest known bryophytes lived on wet mudflats during the early Devonian, but it is likely that they colonised the land during the late Silurian. Vascular plants, which emerged during the late Silurian resemble green algae from which they evolved. Cooksonia was the first to evolve. It was a small plant (six centimetres) that lacked leaves, but had spherical spore sacs at the ends of its branched stems. A little later Zosterophllophytina (the ancestor of the clubmosses) and Rhyniophytina (ancestral to leaf-bearing Trimerophytina and all the other vascular plants we see today) appeared. 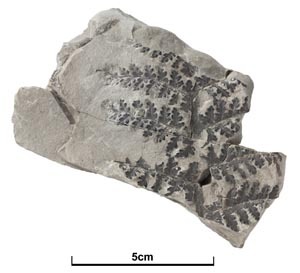 The earliest plants grew in areas like the coastal mud flats of the early Devonian (410 million years ago): the non-vascular bryophyte Sporogonites (1) grows alongside vascular Cooksonia (2), Rhynia (3), Zosterophyllum (4) and Drepanophycus (5). A bottom-dwelling fish searches for food. Annularia, the leaves of a giant Carboniferous horsetail which grew up to 16 metres high. Pecopteris, a fern from the Carboniferous. During the Carboniferous many new groups of plants evolved and great forests grew in the tropical swamps and deltas. Trees were not like those we know today, but mainly clubmosses and horsetails, and the earliest gymnosperms (seed-bearing plants) like conifers and seed ferns also developed. Conifers grew mainly on the high ground and are rarely fossilised, although cones are occasionally found. Seed ferns, the only major plant group to have become extinct, were usually small, but Medullosa grew to about five metres tall. The first forests were the great tropical coal forests of the late Carboniferous (300 million years ago): tree-sized horsetails (Calamites 6), club-mosses (Lepidodendron 7), tree-ferns (Psaronius 8), and the seed ferns (Medullosa 9), rise above an undergrowth of ferns, seed ferns, herbaceous horsetails, like Sphenophyllum (10), and clubmosses. Giant Carboniferous dragonflies and amphibians inhabit the forests. Calamites, a horsetail stem from the Carboniferous coal forests. The Carboniferous seed fern Neuropteris belonged to a group of plants that became extinct in the Cretaceous. A ginkgo leaf from the Jurassic; today the last species of these deciduous trees grows up to 30 metres tall and has similar pale green, fan-shaped leaves. Gymnosperms dominated the plant kingdom during the Jurassic and Cretaceous. Conifers continued to thrive and cycads and ginkgos spread throughout the world. By the Jurassic, cycads and cycad-like plants (cycadeoids) were abundant and widespread. Some cycadeoids had what look like flowers, but these were in fact petal-like scales for seed dispersal rather than pollination. Ginkgos, or maidenhairs, grew throughout the northern hemisphere until the end of the Cretaceous, when they began to disappear, so that only a single species, in the forests of western China, is left today. Wealden woodlands: Mesozoic plants in an early Cretaceous landscape (130 million years ago): conifers (Pseudofrenolopsis 11), cycads (Nilssonia 12), cycad-like plants (Otozamites 13) and (Pseudocycas 14), and tree ferns (Tempskya 15) abound. Small ferns like Weichselia (16) form the undergrowth. Horsetails (Equisetites 17), non-vascular liverworts (Hepaticites 18) and clubmosses (Selaginellites 19) grow in the wetter areas. The herbiverous dinosaur Iguanadon feeds on the Wealden plants. A fossil flower Silvianthemum suecicum, a saxifrage from the Cretaceous rocks of Sweden (false colour). Flowering plants (angiosperms) are the most successful plants to have evolved. Of the 300 000 species of plants in the world today, about 250 000 are angiosperms. Their diversification started in tropical regions during the Cretaceous and by the Palaeogene they had spread globally. The oldest known fossil angiosperms, were found in Lower Cretaceous rocks in America and Russia. They are known from their leaves, pollen, seeds, branches, etc, but not their blooms. Flowers, are short-lived, delicate and rarely fossilised. The oldest known petals come from Middle Cretaceous rocks in North America and are related to Magnolia. The Earth blooms in the Palaeogene forest (about 50 million years ago): mangroves (Bruguiera 20 and Nipa 21) grow in wet areas. Inland, Pinus (22), Platycarya (23), Nothofagus (24), Cinnamomum (25), Meliosma (26), Corylopsis (27) and Mastixia (28) grow with a ground cover of ferns. Flowering plants flourish such as Magnolia (29), Oncoba (30), Rubus (31), Hibbertia (32) and Uveria (33). Birds and mammals are now widespread. A frond of Cladophlebis, a small fern that grew amongst the large conifers and cycads in southern England during the Cretaceous. Welwitschia from the Namibian desert can live for up to 2000 years. Its leaves may reach ten metres long. By about 50 million years ago, more plants were similar to those of today. This laural leaf comes from Palaeogene rocks on the Isle of Wight, southern England. The last major group of gymnosperms to evolve, the Gnetophytes, is little known and comprises only three living genera: Gnetum, Ephedra and Welwitschia. Pollen of this group has been found in Palaeogene and Cretaceous rocks, but its earlier distribution and origins are obscure. Welwitschia is an unusual plant as it lives in the Namibian desert where its only source of water is from the fog that condenses on its leaves. Plants have grown in Britain for over 420 million years and fossils can be found with careful search. Some of the earlieast plants are found in Silurian and Devonian rocks of Wales and Scotland, and many fossils are found in the Carboniferous coalfields. Jurassic and Lower Cretaceous rocks of eastern and southern England may contain fossils of plants as well as the dinosaurs that ate them. Although flowers have not been found in Britain, leaves, seeds and pollen of angiosperms occur in Cretaceous and Palaeogene rocks. The evolution of the main members of the Plant Kingdom through geological periods and time (left) and its relationship with the Algae. The four evolutionary scenes shown overleaf are indicated. Plants evolved from green algae, but there is some disagreement as to whether algae are plants or not. Some algae are formed of a single cell and are not plants, but some seaweeds like the green algae (chlorophytes), behave like plants and some people consider them to be members of the Plant Kingdom. However algae do not develop from an embryo and many scientists regard them as being part of Kingdom Protoctista. We tend to think of fungi, such as mushrooms and toadstools, as being plants — but they are not. They neither grow from embryos nor photosynthesise and are put in a separate kingdom. The giant redwood Sequoiadendron giganteum. Conifers are the largest and longest-living plants ever to have grown. The giant redwood, Sequoiadendron giganteum, which grows in the mountains of Sierra Nevada, California, was once much more widespread than today. They grew in Derbyshire, for example, only six million years ago. Over 100 metres tall and with a circumference of 30 metres around the base of the trunk, they live for about 2000 years. But the longest living plant is the bristle-cone pine, which lives in the Rocky Mountains. Some are 5000 years old! Imagine — a plant that was a sapling 3000 years before the birth of Christ and over 500 years before the Egyptian pyramids were built! A 'crow's nest', from the Latest Jurassic Fossil Forest at Lulworth Cove, Dorset. About 150 million years ago, during the late Jurassic, large cycads grew in Dorset. These were buried beneath sediment and eventually fossilised, but some of the tree stumps are now exposed again. Weathering has hollowed out the central part of the trunk to form bowl-shapes up to one metre in diameter. These cycads were thought of as fossil crows' nests for many years. Stigmaria, once thought to be a fish 'of the fresh water kind... taken out of a block of coal... seems to represent a Carp or Barbel'. (Robert Plot, 1677). For many years the roots and stems of Carboniferous club mosses (Stigmaria) were thought to be fossil serpents or fish. Robert Plot wrote a book called 'the Natural History of Oxfordshire' in 1677 and illustrated one of these 'fossil fish'. Fossil tree stumps and Stigmaria can be seen in their position of growth in Fossil Grove, Glasgow. What would the garden look like without a lawn? Although grasses are probably the most common herbaceous angiosperms in the world today, they are very new geologically speaking. Grass first evolved only about 15 million years ago during the Neogene. This was a time of climatic change when forested areas were reduced and the savanna spread.